Extensive empirical and modelling studies have been conducted to investigate individual effects of various stressors on marine ecosystems, particularly the effects of fishing and climate change. Yet, much less research has been dedicated to explore the cumulative and interactive impacts of multiple stressors. Ecosystem impacts of multiple stressors depend not only on species-level responses, but also on species interactions, species diversity and redundancy, ecological history, and ecosystem structure. In partnership with UCT and other collaborators from IndiSeas, we explored the combined effects of fishing and climate change across a suite of regional marine ecosystems, including the southern Benguela. To avoid conclusions being dominated by structural assumptions in a particular model and to reduce model-based uncertainty, we explored the combined effects of fishing and primary production using four state-of-the-art ecosystem models (OSMOSE, EwE, Atlantis, Multispecies Size Spectrum) in different ecosystems. Owing to the structural differences between the models, simulating changes in multiple drivers could potentially produce a wide array of ecosystem responses to changes. However, using standardized simulation experiments, similar responses obtained across this variety of ecosystem and models could help identify plausible scenarios of ecosystem change. We simulated a series of biomass levels of primary producers and various fishing scenarios across different trophic levels. Most of the simulated scenarios revealed that effects of combined changes in fishing and primary production were non-additive, usually dampened. Using an additive effects model in a meta-analytic context, we compared the relative risks of negative synergistic and positive dampened combined effects between fishing and primary production scenarios (Fu et al. 2018). 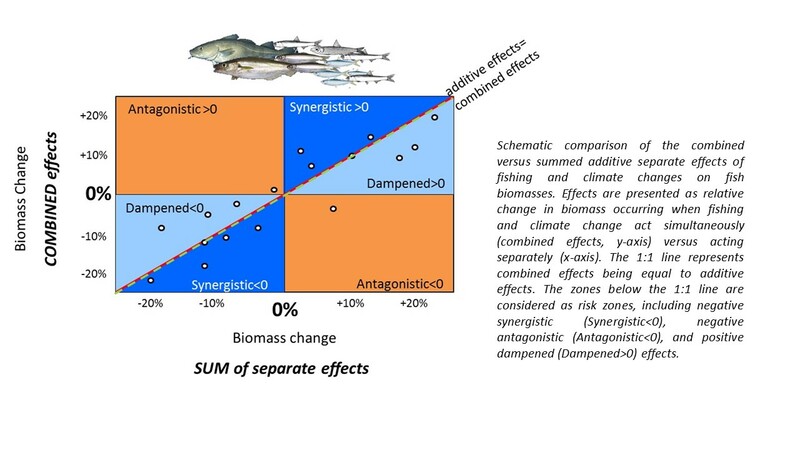 Negative synergism of combined effects exacerbates the reduction of fish biomasses compared with additive effects; positive dampened effects result in lower fish biomasses than expected for additive effects. 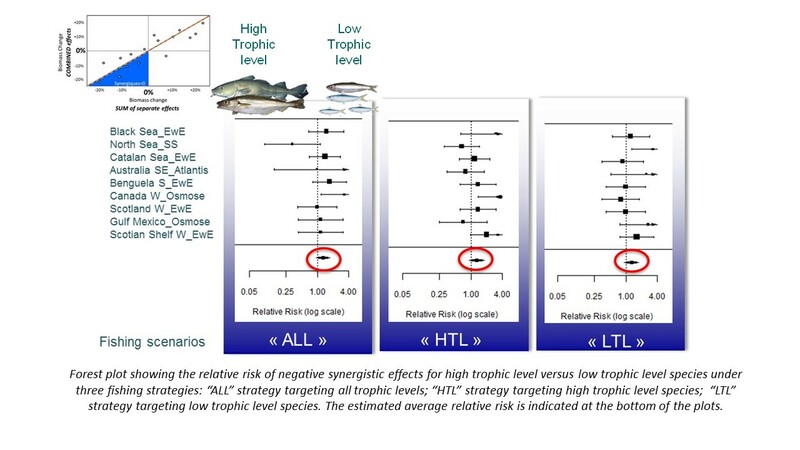 The risk of negative synergism was generally higher for low trophic level (TL) fish taxa, implying that following an increase of fishing pressure on a given low TL stock, the subsequent decrease of biomass under low primary production would be higher than expected when fishing is the sole driver. 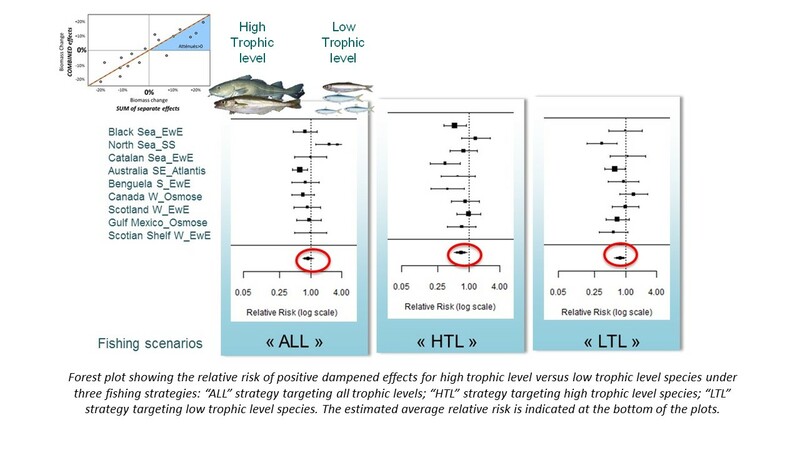 The risk of positive dampened effects was generally higher for high TL fish taxa, implying that given a management measure aimed at reducing the impact of fishing on high TL stocks, the subsequent rebuilding of these stocks would be slower than expected under an assessment taking into account the fishing driver only. These findings could help provide general guidance in fisheries management in an ecosystem and changing climate context.